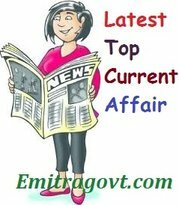 Current Affairs Question: Looking for 01 September Current Affairs? Then start your Quiz right now by answering them. Here in this article, we are giving the Current Affairs Quiz with Questions and Answers. As many people are preparing for various government exams it became mandatory for them to get a grip over the current affairs as in most of the tests are based on Daily Current Affairs. By taking this kind of Current Affairs Quiz candidates can eventually get hold of what they have been working on. Contenders can trust us as we will update all the latest Current Affairs in this quiz. For more such quizzes check our site Emitragovt.com regularly as we will update the Daily Quiz for current affairs. 1. Online cab aggregator Uber launched country’s first ridesharing insurance programme for its driver partners in India. 2. Spanish clothing brand Zara’s Co-founder Amancio Ortega surpassed Microsoft Co-founder Bill Gates as the world’s richest person. 3. Bangladesh registered its first ever Test win over Australia after defeating them by 20 runs. 4. Japanese table tennis player Tomokazu Harimoto, aged 14 years defeated German Timo Boll in the Czech Open final to become the youngest winner of an ITTF men’s singles. He broke the record of China’s Yu Ziyang. 5. According to the market research organisation Ipsos MORI’s survey, India is ranked seventh in the world in a survey of 12 countries that have a positive influence on global affairs. Canada has topped this list. 6. Drug pricing regulator NPPA and National Anti-Doping Agency (NADA) have launched an app ‘Pharma Jan Samadhan’ to help athletes understand medicines that could contain prohibited substances in sports. 7. Union Home Minister Rajnath Singh inaugurated “YUVA – Skill Development Programme”. YUVA is an initiative by Delhi Police under Pradhan Mantri Kaushal Vikas Yojana. 8. Mohammad Mustafa took charge as the chairman and managing director of Small Industries development Bank of India (SIDBI). 9. Prime Minister Narendra Modi inaugurated 1.4-kilometre long hanging bridge across the river Chambal in Rajasthan’s Kota. 10. Karnataka government will merge the existing seven health schemes to launch a unified scheme- ‘Arogya Bhagya’ which will cover all 1.4 crore households of the state.